This post has been published with permission from Indian Management Magazine. Over the past 16 years, Yves Pigneur and I have been dedicated to a single mission: how to help companies continuously reinvent themselves. We created some of the tools and methods to deal with this challenge. The crucial question we are helping to answer: How can C-Suite leadership teams harmonize the demands of public markets and activist investors to cut costs; buy back shares and simultaneously reinvent their organization; unleash entrepreneurial talent, and position it for future growth? We believe there are three crucial areas that every company needs to consider in order to remain relevant and prosperous. Firstly, companies have to develop truly ambidextrous organizational structures where the innovation arm is given equal power alongside the existing business. Secondly, this innovation arm needs its very own culture, processes, skills, metrics, and incentives to explore potentially new business models and value propositions. Thirdly, companies need to better manage their portfolio of existing businesses and new opportunities--some that maintain and protect the current business, while cultivating the business models of tomorrow. Let’s explore deeper into each area, and why it matters to companies today. 1. Every organization needs a Chief Entrepreneur equipped with power. Companies that pursue real growth innovation need to give the activity real leadership with real power. This is a whole new organizational chart of people and skills led at the top by a Chief Entrepreneur. This doesn’t discredit the success corporations and CEOs have generated from finding a successful business model and improving it over time. They are where they are because they successfully scaled and continuously improved a proven business model. However, to achieve substantial and continued growth in the 21st century, companies will have to look beyond improving the existing business model or simply launching new products. These actions just won’t generate enough growth anymore. You would have to be schizophrenic, and have more than twenty-four hours in the day, to be world-class at both jobs. In order to excel at both, you need a powerful person skilled at execution who focuses on the present, and a powerful person skilled at entrepreneurship who focuses on inventing the future. You need to create an innovation engine that will function alongside your current business. This “ambidextrous culture” is how you will survive in the 21st century. Over a decade ago O’Reilly and Tushman described why companies need to be ambidextrous (executing existing business models while creating new ones). Yet in spite of facing continuous disruption, only a few companies (like Amazon) have truly ambidextrous strategies that focus on world class execution, operational excellence, and strategic growth innovation simultaneously. In fact, Amazon's entire organization and organizational culture is designed to be ambidextrous. Rare are companies that deal with the rapid shifts in channels, customer aggregation, pricing, technology, etc, by creating new business models (Amazon Web Services, Netflix Studios, etc.). Most continue to execute their existing business model or make small extensions to them. In the U.S. in particular, existing companies are afraid of a proxy fight with activist investors who focus on traditional cost cutting and share buy-back programs to please their investors. The organizational structures that characterize established companies today are unlikely to produce new growth. At most companies “the core” still dominates innovation. Business units with established business models and value propositions tend to dictate the innovation agenda. They favour short term gains through incremental and sustaining innovation over growth and transformative innovation where new value propositions or business models are uncovered, especially if it undercuts the core business. We like to say that business models and value propositions expire like a yoghurt in the fridge. The reality is that business models are expiring faster than ever before. The likelihood of a CEO managing a single business model through his or her tenure no longer exists. You have to also invent the future, which will require systematically and continuously inventing new business models. You not only have to be world class at executing and improving your current business model, but you also have to be world class at searching and inventing new business models for the future. 2. Innovation culture: different metrics, skills, processes, and incentives. Although an innovation culture is difficult to achieve, we do believe that companies can intentionally design an innovation culture that unearths and builds new growth engines, reduces the risk of experimentation, and increases ROI on R&D. To make that happen you have to recognize that your innovation culture requires very different skills, processes, and incentives than your execution culture. Again, we developed a tool with XPLANE founder Dave Gray called the Culture Map to help companies capture, discuss, and manage company culture. The tool allows teams and leadership to ask: what are the concrete results we want to create? Let’s say you want your company to reduce innovation risk; get a higher return on any R&D being performed; and build new growth engines. On a managerial level, you’ll probably want to retain your talented teams, and build a company that’s designed for the future. Think about the impact leadership, culture and processes, and organizational design has on your company. Ask the team: what causes and influences our behaviors? What are you as a leader saying or doing to enable these behaviors? How are people rewarded for their behaviors (both positive and negative)? What are the unwritten rules? It could be the requirement of business plans well before you’re ready to execute; a lack of knowledge or training when designing, running, and managing business experiments; and it could be that your process is linear rather than agile. Another example: leadership can provide support throughout the company to give legitimacy and power to intrapreneurs responsible for managing the search for new value propositions and business models; and they can allocate sought after resources. By championing methodologies like design thinking, or tools like the Business Model Canvas and Value Proposition Canvas, leadership can enable the right process and skills development for teams to design, run, and manage agile business experiments. Traditional R&D is what large organizations believe to be a remedy for disruption. But like we pointed out above, simply creating new products and technologies won’t save your company from being disrupted. When you look at the greatest companies around today, how much do you think they spend on R&D? Big sums. Now, how much of that money goes into figuring out the right value propositions or business models and bringing them to market the right way? Probably very little or none. In fact, good innovation doesn’t necessarily have to be tied to a product or technology if the value proposition creates value for your customers, and your business model creates value for the company. Good business model innovation starts with your culture. 3. Manage a portfolio of mature and emerging businesses. Finally, companies need a new and integrated approach to managing a dynamic portfolio of established and emerging businesses. They have to protect established business models from disruption as long as possible, while simultaneously cultivating the business models of tomorrow. 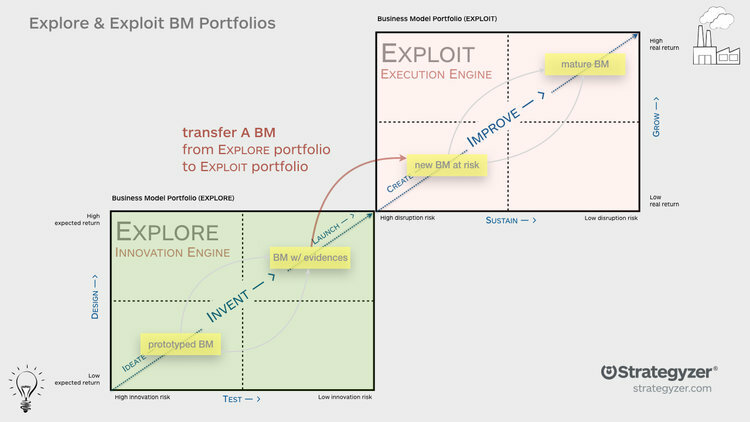 Yves Pigneur and I have also prototyped a tool here called the Business Portfolio Map to help organizations measure and assess if the existing portfolio is healthy; if the business is prone to disruption; and ultimately, to help companies make better investment decisions. Profitability: How much profit do the existing business models generate? Disruption risk: How protected is your business model, and how likely is it to be disrupted? Models at risk may be very established businesses, but prone to disruption for technology, market, or regulatory changes. Expected profitability: How big can an idea for a new business become? What’s the potential? How big is the size of the new market, revenue potential, pricing, etc. Equally important here is to judge how robust a business model is: e.g. in terms of recurring revenues, long term growth, scalability, protection from competition, etc. Innovation risk: Here you evaluate how much you de-risked a good looking business initiative. These ideas may have no evidence, and may be very risky to invest in. The more you are confident an initiative will work based on tests and the resulting evidence, the more you may choose to invest time and resources into it. This is where the Lean Startup--founded and conceived by Steve Blank, then popularized by Eric Ries--has great potential to help large companies tackle the challenges that come with de-risking innovation. We have been involved with the process from the beginning. It is important to point out that the invention of new businesses is a search process. Finding and validating a new growth engine is a very iterative process, contrary to the managing of an existing business. Amazon is an example we frequently cite of a company that intentionally manages a diverse portfolio of existing and promising new business models. The company continues to produce growth with its existing businesses (e-commerce, AWS, logistics, etc. ), while juggling a portfolio of potential future growth engines that may become big profit generators one day (e.g. Alexa, Echo, Dash Button, Prime Air, Amazon Fresh, Mayday Button, etc.). Building an invincible organization with the traits we’ve listed above is something investors should be demanding: it helps companies better allocate capital and put people with the right skills at the right stage of development. But of course, it also means you have to keep investing in new ideas and businesses. This is going to be a difficult journey. The truth is, there’s never going to be a right time to start. If you don’t want to end up like Kodak, Nokia, or Blackberry, then you have to start now.